This IMCA modified has run at San Jose, Watsonville, Antioch, Petaluma, and most recently at Merced Speedway in the Central Valley of California. Fowler Automotive has been involved with the car over seven racing seasons providing engine service originally; and in the last five , complete assemblies. Jim Pennington is the car owner and has chosen to run an all-Ford drive train based on a Windsor 351 CID block. Cleveland heads are substantially reworked as are the much longer connecting rods. At various times Fowler Automotive also provided shop space for weigh-in adjustments and wheel alignment. In 1997 the car won several heat races, a main event, and lead many laps. It almost always finished in the top five or spun out while leading... the team had a new driver that year, Brett Montana. In 1998 we again had several new drivers, Galen Carrera, who ran mini sprints at north bay tracks in prior years. Daren Pennington who had raced dirt Karts with some success, and John Kirkpatrick who wanted to move up from entry level stock cars. For 1999 John Kirkpatrick drove (rookie year). He finished 8th at Merced and 19th in the five state IMCA Western Region. In 23 starts I believe he won more heats than any other driver at Merced, three trophy dashes and had a 3rd place as his best finish. In 2000 the car was stored pending a sale that never materialized. For the 2001 season Jim Pennington drove for fun as his time and finances allowed. The sponsors of Jim Pennington Racing are Blossom Valley UNOCAL and Fowler Automotive. Central Tools in Sunnyvale, Monsters of Rock, Bradley Nameplate of Fremont CA, and Custom Alignment of Mtn. View CA. helped out in prior years. Ray Jacobson at Tuban Industrial Products, Mtn. View has provided invaluable help with the Ford combination. Bill Jones of Taylorsville Utah and Kelly Owen of Santa Clara were great technical advisers. Jim Pennington was president of X-act Computer Service located in Sunnyvale until his passing in 2003. My understanding is the car was sold several years later and it's spare engines were sold seperately. I have some parts and build / tech specifications for them if the new owners need service. 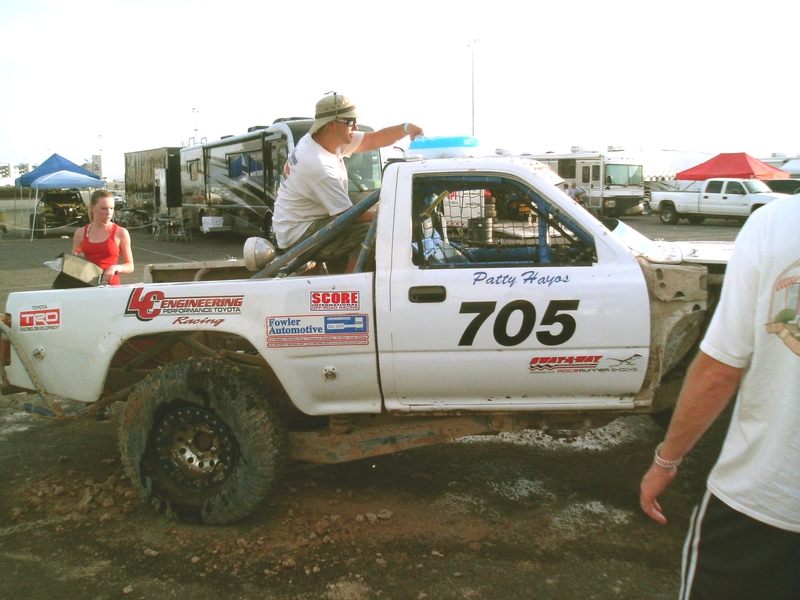 Hayos Racing has been running a Toyota Truck in various configurations for many years. They have won several regional championships and gained considerable respect for fair and even handed competition. Their teams history can be followed at Hayos Motor sports I started helping their team with technical questions in 2003 regarding their 22 R based race engine and some tuning issues. That lead to further involvement until in 2006 the truck was switched to a V-6 engine based off a 5V-FE Toyota product converted to racing use by a prominent north Bay Area shop. That engine was rebuilt in my shop to reverse engineer it's secrets, document it's parts list, and prove it's horsepower. It was later dyno tuned in Fremont CA to re-set up the fuel injection management system. That engine powered the truck at the Terrible Herbst SCORE race in 2007 where their team ran in 4th place until overturning on a triple jump which accident injured Patty Hayos the trucks driver. She has recovered and the truck is being rebuilt for the 2008 season. Part of that effort is overhauling the 5V-FE engine again because it sustained minor damage from running upside down. That was done in my shop and installation was done at the Hayos Racing facility. It is presently being run for testing and practice on a track in the Prairie City Off Road Park in central California. Several additional Toyota engines have been obtained for modification and development at Fowler Automotive because this platform has a lot of room to make more power. At least two more chassis are being built by the Hayos team and the teams future looks promising.